The baby who was rescued from a drain in Durban on Monday is doing well. A three-hour rescue operation saved her. The newborn baby who was rescued from a stormwater pipe in Durban on Monday morning is in good health, her attending physician has said. "She has been awake, responsive and crying. Her glucose and sugar levels are good. She is stable enough for [a] transfer to base hospital so the social aspect can be sorted," Dr Timothy Hardcastle told journalists at Chief Albert Luthuli Hospital. He added: "From the medical side, all is sorted. We did what is known as a babygram and found nothing broken and no serious injuries. From our side we are satisfied and happy." Members of the media were given the opportunity to see the baby that Hardcastle estimates is no more than three days old. Hardcastle said that the infant, dubbed a "miracle baby", arrived at the hospital just after 10:00. "We were called by [the] rescue helicopter service and one private ambulance service saying that they rescued a child that had been trapped in a stormwater pipe for unknown duration. They asked if we could accept the child and we said no problem." He said that the biggest challenge when the little one arrived was her temperature. "The main problem was that she was very cold. She came in at 35.5°. We warmed her up and washed [off] dust and cleaned her abrasions. Our colleagues from pediatrics came down and brought through basic medications." Hardcastle said staff at the hospital believed her survival was a miracle. "Any child that survives a certain amount of hours is a miracle. It seems like she was trapped for at least five hours in a stormwater pipe." 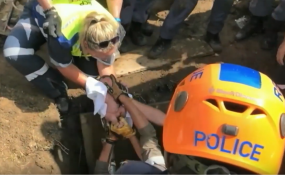 The miracle baby was saved from the pipe after emergency services conducted a three-hour mammoth rescue in Newlands East. Passers-by heard the child's cries around 07:30 on Monday and alerted authorities. Rescue Care spokesperson Garrith Jamieson said that emergency services were on scene in Newlands East on the corner of Barracuda Road and Herring Way. A rescue effort involving the police search and rescue unit together and numerous other services continued for three hours. Skilled officers had to burrow into the ground and stabilise the area around the pipe. The child could be heard during the entire rescue. "We can hear the baby crying. Durban fire department and the police search and rescue have cleared around the pipe and are trying to reach the child," Jamieson had said during the rescue.